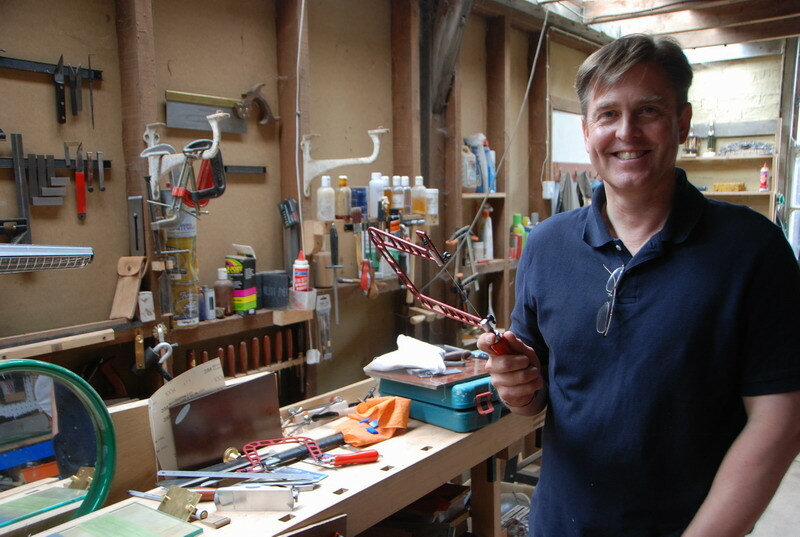 David Barron popped in today to drop off a copy of his new Dovetailing DVD and some Knew Concepts jewellers saws for me to try. Man are these things light - but it's not just how light (120g vs 185g for our standard 5" jewellers saw) it's also how that weight is disributed. With a standard saw most of the weight is in the frame, resting on your index finger with 5" of mechanical advantage. With the Knew Concepts saw the majority of the weight is in the handle, so although it is only 1/3 lighter it actually feels about 2/3 lighter in the hand. They are also very stiff, so you don't get any compression of the blade on the forward stroke which is the biggest cause of blade fatigue. Tension wise, they are about the same (although our standard adjustable frames do achieve a much higher tension than just about anything else on the market) with a heavier gauge skip blade installed what you really want to hear is a very short, high pitched 'plink', if it's still going 'pingggg' it's not tight enough. 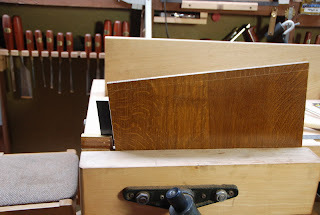 The weight advantage makes the 8" version a no-brainer for me, the only disadvantage with a deep saw is the weight - take that away and you may as well just have one saw that will trim DT's in a 16 inch wide board. Having said that there will be those who don't want to stretch the extra few quid or never use boards wider than 10" so we will probably end up stocking both sizes. All in all a very nice piece of kit. Essential? No. Best on the market? Yes. Anyway, once I'd got over the whole 'David Barron - in my workshop - how cool is THAT!' thing, we had a really good chat about all sorts of tools and techniques. Here's a couple of top tips I picked up for freehand dovetailing. Always engage the knife in the mark and then move the square to the knife. This is much more accurate than trying to align the square on your mark and then striking a line wherever it ended up. 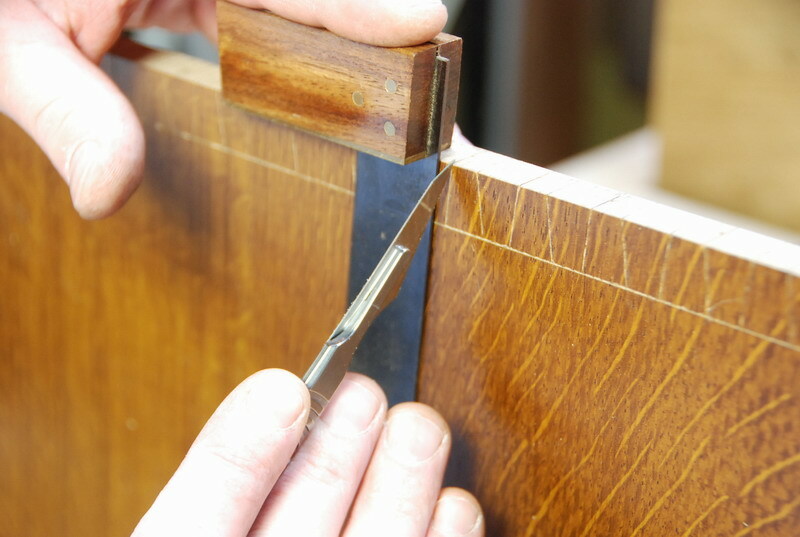 When securing your board for sawing, use your dovetail marker to set the angle of the board. This way your saw is working vertically (as it was intended to do) and gravity is assisting accuracy rather than hampering it. Cant the board the other way to make the cuts on the opposite side of the tails. David's DVD covers guided dovetailing - a foolproof way of achieving outstanding results. 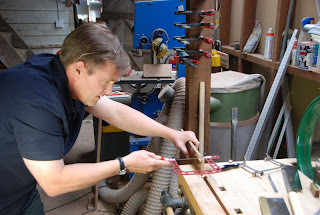 It is a well thought through technique, with guidance on how to make the necessary workshop aides and also has a very good aside on bench design and configuration. The quality of production and clarity of tuition are both outstanding and I am more than happy to recommend it.